2 Level 3 monsters Once per turn, if this card has material: You can target 1 “Number” Xyz Monster in your GY, except “Number 71: Rebarian Shark”; Special Summon it, and if you do, attach 1 material from this card to it. If this card is sent to the GY: You can choose 1 “Rank-Up-Magic” Spell from your Deck and place it on top of your Deck. Finishing up this week we’ve got Number 71: Rebarian Shark. Not much on ATK, an okay defense for a Rank 3. Generic materials needed, WATER and Dragon-Type support backing it. Rebarian Shark is an Xyz monster to support other “Number” Xyz monsters, as well as the “Rank Up” strategy. Moving a material to a different Xyz monster is cool, and being able to reborn another “Number” Xyz monster is a great effect all in one. You can do this twice, meaning you essentially have two Monster Reborns for your own “Number” monsters. When Rebarian Shark hits the grave you can move a “Rank Up” spell to the top of your deck. Would be better if you could get the card off Rebarian Shark’s destruction. Rebarian Shark feels like a monster to get to a better monster you already used. Some monsters to name a few for this card’s effect would be Big Eye, Utopia, Blackship of Corn, Baguska (once released) and Silent Honor ARK. 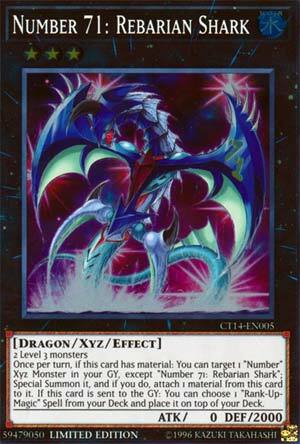 If you have a Link Monster on your field you can Xyz Summon this card, then go after another Xyz “Number” in your grave. There are better Rank 3 monsters that are generic and produce better effects for your strategy. We end this week off with the other new Number monster, which supports Rank-Up-Magic cards and has art similar to Rank-Up-Magic Barians Force. The opposite of Number 17, Number 71: Rebarian Shark. Rebarian Shark is a Rank 3 requiring two Level 3 monsters, easy enough, though Terrortop and Tour Guide are both limited. Once per turn, if this card has an XYZ material, you can target a Number XYZ monster in your GY, except a Rebarian Shark, and Special Summon it as well as attack a material on Rebarian Shark onto that revived Number monster. Reviving monsters is cool and all, but there are so few good Number monsters, and I don’t that many are worth reviving, and those that are might not be able to fit this in. If this card is sent to the GY, from anywhere, you can place a Rank-Up-Magic on top of your deck. The only Rank-Up-Magic you might care to Top Deck is The Seventh One, otherwise you would prefer to search it. Rank-Ups are mediocre at best because of their brick potential, so why couldn’t this just go ahead and search them? Card is cool, but that doesn’t make it great. I kinda do like the idea, just think the execution could of been better. Rounding out this weeks lot of new cards is Number 71: Rebarian Shark, a rank 3 Xyz with 0 attack and 2000 defence. Rebarian Shark comes in the form of a water dragon needing 2 level 3 monsters as material. And is Rebarian any good? Let’s take a look. First up, once per turn if Rebarian has material, you can special summon a Number Xyz from your grave and put one of Rebarian’s materials on it. A pretty good effect mid to late game, that’ll facilitate, at best, a #39 Lightning play. Rebarian’s second effect is that when it’s sent to the grave, it doesn’t matter how or where from, you can put any Rank-Up-Magic spell on the top of your deck. A really strong, yet niche, card effect. Not many decks need to use the RUM spells these days, with Utopia the Lightning being the only ranked up Xyz monster seeing any competitive play at all right now. Rebarian Shark is a nifty and neat little monster, letting you toolbox a few things late game, but sadly there are better options for revival and ranking up monsters right now. If it’d been released a year ago, it would’ve been a different story. But it is what it is, and in its defence, it does have quite nice artwork. Advanced 2/5 It’s a very niche monster right now. Most probably working best in a Utopia deck that’s filled with Rank-Up-Magics. Number 71: Rebarian Shark, closes the week. This is a Rank 3, Water attributed, Dragon Monster, who is XYZ Summoned with two Level 3 Monsters. 0 attack is never good (despite whatever effect(s) may be included, but 2000 defense isn’t so bad on a Rank 3. So, once a turn, if this card has Material, you can Target a Number XYZ from your Graveyard, and Special Summon it. If successful, one Material from that card gets added to this one. I’m not entirely sure why that’s necessary, as this doesn’t state you have to discard one to activate this effect though. If this card is sent to the Graveyard, (no specification as to how) you can add a Rank Up Magic card from your Deck and place it on top of your Deck. Here’s the problem with that…Rank Up just isn’t a very playable or viable thing. It can be done, and it’s nice to have an asset in that arsenal, but this guy just doesn’t do enough on his own, or even with that effect to make me want to use Rank Up anything. T-REX This is one of the new monsters released from the latest tins, and I actually quite like this, for quite a number of reasons, but firstly I’ll start with the artwork, it looks pretty cool, but what I’d suspect that most have not noticed is the stars in the background of Rebarian Shark… Although I suspect that you will notice them when I point out that those stars are the exact very same ones that are found in Rank-Up-Magic – The Seventh One… And the card that I suspect the game developers had specifically in mind when creating this card. Number 71 is extremely easy to Summon, 2 Level 3’s, which although harder thanks to Limits on Speedroid Terrortop and Tour Guide to the Underworld, can still be easily made via something like Sacred Crane. However since Number 71 has 0 ATK, you’ll always be Summoning this in DEF and then you’d use this effect to revive one of your Number Xyz’s from the Graveyard, with a material which Rebarian Shark will graciously provide. And once Rebarian Shark is sent to the Graveyard, which just like with Elder Entity N’tss can also be from the Extra Deck, you are able to place 1 “Rank-Up-Magic” card from your Deck onto the top of your Deck, and which brings me to the card I mentioned earler, Rank-Up-Magic – The Seventh One… Because lets be honest, this card seems to be the perfect support for such an awesome card that barely if ever sees any play. Hopefully this might be able to do just that… One day at least.